Home » Greenroom » Should You Use Cloth Or Paper In Your Kitchen? Should You Use Cloth Or Paper In Your Kitchen? If you work in a kitchen, or you just like to prepare your own meals at home, you know how messy kitchen can become. Naturally, when you spill something you will reach for a towel to clean the mess. Have you ever wondered what’s better – paper or cloth towels? If you have, read on, because we are going to try to resolve that dilemma for you. Of course, good old paper towel seems like the obvious option. It provides you with a practical and quick way to remove the spill. Many people like paper towel for their no nonsense approach – you take a piece of paper, use it to perform its function and throw it away. However, this is where the problem lies. Paper towels can create a lot of unnecessary waste. Using a recycled variety doesn’t help much either – you are still producing waste that can be avoided by, you guessed it, using cloth towels. Efficiency – cloth towels work better. The thicker fabric makes them more absorbent and they have a thicker pile for collecting dirt. 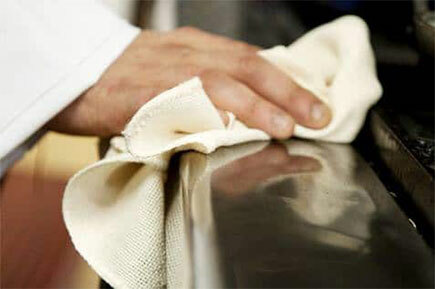 Cost effective – cloth towels are reusable. Even using a rental system to keep up a supply of clean cloths can work out cheaper than buying never-ending rolls of paper towel. Environmentally friendly – not only are cloth towels reusable, they also reduce the amount of waste your kitchen produces. We’ve established that reusable wipes work better, are more environmentally friendly and are cost effective. But who is going to clean them? And how can you be sure they conform to workplace health and safety regulations? A rental program can take care of all of this for you. 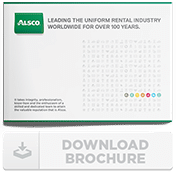 Alsco’s rental program conforms to all relevant workplace health and safety requirements. Using Alsco’s service means there’s no capital outlay – the costs associated with purchasing are eliminated and you can rest easy knowing you’ll always have clean wipes on hand. Running a commercial kitchen just got a little bit less messy. Make your kitchen less messy too. Try these Alsco food and glass wipes for yourself and decide!